Love all the bright colors & prints at the various Fashion Weeks. So ready for spring. What a great array of inspiration! Thanks for posting! The green suit and the polka dot top outfit are super cute. Great pics. Neon! It's everywhere! Love that first look she looks fabulous! love the colors! visually beautiful and those ladies sure know how to make a statement. OMG...i LOVE them all! but ESP the navy & lavender combo! totally going to try that one out! Def ready for spring! Love this round up! So much inspiration here! Love the pumps of the first picture, super cute! That top picture reminds me of the wind we have been having here! worst! Great inspiration, love all the color! Great photos! Thanks for sharing! Loving all the brights! Love these photos-especially the polka dotted ones! I love the 3rd photo - the highwaisted trousers and spotted blouse are so chic together! That first image is perfection! What a flawless way to show off a great body: a figure-skimming, sheer, long skirt and cute cardigan, both in pretty colors. Love this post! i especially love that bright pink skirt, such lovely inspiration. it seems that the whole world is warming up except for israel...but i cant wait for spring and summer!!! I am in love with that polka dot top, wide belt & trousers...so perfect! How I wish spring would hurry up and get here! Such an fashion inspirational post for this spring. Oh Taylor, I love you. Oh that first photo is my new inspiration, love the airy lavender grounded with the big hat! These photos are so…marvelous! I want EVERY single thing! I love both the navy blue looks. The soft pink mixed with navy is so chic and romantic. I also love the polka dots with the navy pants, it pops so great off her bright red hair. That first image is gorgeous! The flowing skirt in the wind and the colors she incorporated into that outfit are great! I LOVE the third and fourth looks. So chic. wow the red head is stunning! love the white with black polka dots!! I love as well! Spring is almost here! I LOVE your blog!! Do you have any advice on how to search for pieces? For example the purple skirt in today's blog post and when you click on the #1 link there are a blue pair of trousers with a gold zipper down the front. LOVE THEM!! Thanks! I love all of them pictures! great colours! 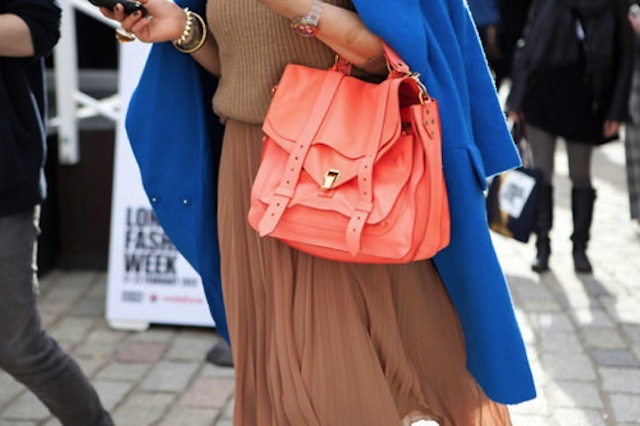 I love that blue-coral combination so much!I used to pair coral pumps with blue dress as my fav. outfit 2 years ago) still in love with it! Love all of those looks too! Thanks for sharing this! I absolutely adore the first picture with the contrasting lavender and navy. So chic. This would be a outfit worth recreating! Love the bright green outfit in a sea of black. I'm guessing that was from NY Fashion Week? I absolutely love these images! i'd repinned the one on top, so beautiful. i love the combo of lilac and navy! I have been coveting that neon coral PS1 bag for a while now! It's like candy. i came across that first photo the other day and fell in LOVE! so feminine and fun! love love love all of the colors + prints! Hi dear. This photo is very beautiful : ). Holy bird dress! Love the colors.